The following plans describe a method of adding MIDI capability to the Korg Synthe-Bass analog synthesizer with the Synhouse MIDIJACK II: Hertz so good! This installation is difficult to do and is recommended that you send the instrument to Synhouse L.A. for a quick, low-cost Factory Installation. The particular installation on which this document is based was done by Synhouse, but this article is not meant specifically for user self-installation. These are the brief service notes used by Synhouse Factory Installation which are being offered for free reading. Synhouse is not responsible for the accuracy of this information, nor for your ability to understand it, nor any damage to your instrument or MIDIJACK II resulting from the use of it, misuse of it, or inability to use it. Those who choose to read it and use it do so at their own risk. Synhouse will not offer any support for this article and will not attempt to answer questions about the Korg Synthe-Bass. This instrument is 25 years old, is extremely rare, and does not have any silkscreen on the single-sided circuit board, so anyone trying to repair it or install the MIDIJACK II needs E.S.P. to know where to connect and which components are which. The Synthe-Bass is a Korg product and all questions should be referred to Korg. Locate the LM741 on the main board. It is a TO-5 metal can and unlabeled on the board, but the only one there is. Remove the board and cut the PCB trace from pin 3. 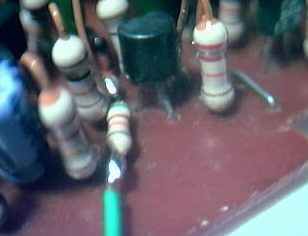 TO-5 pins are arranged as seen here from above: The next photo shows a black dot of ink where the trace was cut. 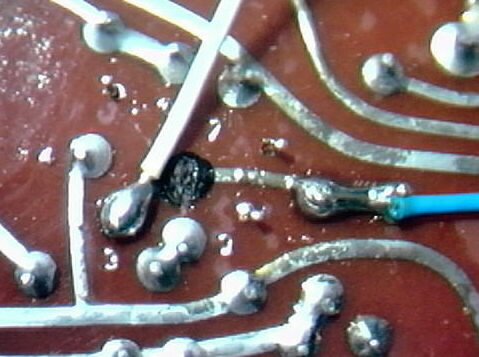 It also shows the blue wire soldered to the trace and the white wire soldered to pin 3. Connect the green wire to a new resistor of approx. 51K. 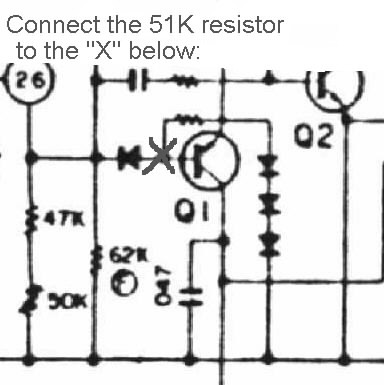 (Note from Synhouse: If you do not have a 51K resistor on hand, Synhouse will provide this part free of charge if you specify your intention to do an installation in the Korg Synthe-Bass and ask for the 51K resistor in the NOTES box when ordering online.) Solder the other end of the wire to the base of transistor Q1. The base is pin 3. 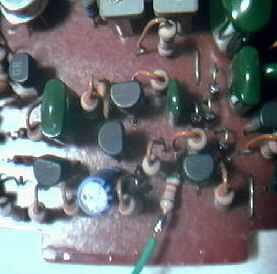 This transistor is said to be a 2SA608G. The first Synthe-Bass installation done by Synhouse was s.n. 750065 and the second one was s.n. 780399. The first one had tiny pod-like transistors that looked like a lunar lander or a dipped cap. It also has no PCB marking whatsoever, which took up hours to find the pins on Q1. The second one had more normal-looking TO-92 plastic transistors and some faint designators for about 2% of the leads found on the lower side. 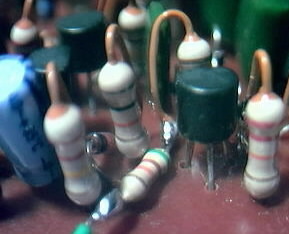 These labeled the TO-5 pins as seen above, but left the location of Q1 unknown. Also, who ever heard of a 2SA608G? If damaged, Q1 can be replaced with a 2N3906. Close right: You may need to buzz it out, here is the schematic view: The local keyboard will still trigger the envelope generator when the MIDI is active. The Single/Multi env. triggering modes of the MIDIJACK II add a whole new dimension to the sound of the Korg Synthe-Bass.